The Astronomik CLS is a budget filter for visual observation, Black & White photography and CCD photographs of nebulae, galaxies and star clusters with astronomical instruments of any size. The EOS Clip model plugs directly into the Canon EOS camera body (compatible with all Canon EOS camera with APS-C sensor) so it is very practical to use. 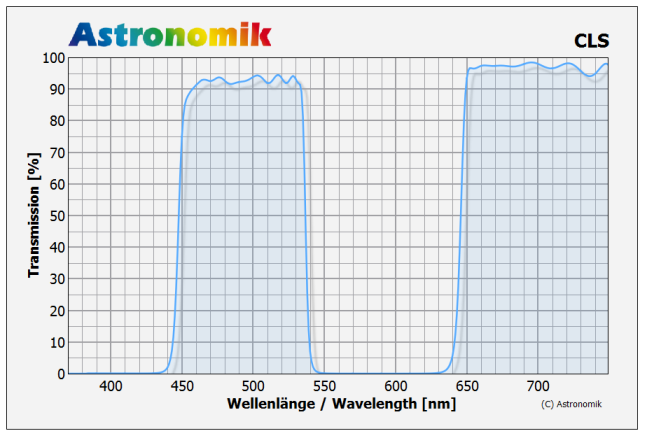 The Astronomik CLS blocks the light of the spectral lines of mercury and sodium-vapor lamps and lets the largest part of the visible light and H-alpha emissions pass. All the important emission lines, as well as the spectral region that the very well dark adapted eye can see, can pass through the filter.